Seasonal Magazine: RPP Infra Projects IPO - Invest or Wait? RPP Infra Projects IPO - Invest or Wait? RPP Infra can be a reasonable buy for those investors who are bullish on the prospects of small-cap construction companies in the country’s emerging infrastructural boom. RPP Infra Projects IPO which was subscribed almost half (0.48 times) by the close of first day is likely to be subscribed multiple times by the last day, if investors warm up to this infra story, which is not widely known outside of Tamilnadu and the Southern States it largely operates in. Post the IPO which opened on 18th November and closing on 22nd, the company will be listed in the Indian capital markets segment of ‘Construction & Contracting - Civil’. This segment is highly competitive, already having 65 listed players ranging from large players like Jaiprakash Associates, Lanco Infratech, & HCC, to medium-sized players like Supreme Infra, PBA Infra, & Mukand Engineers, to smaller players like Elnet Tech, Martin Burn & IRB Infra. The first thing investors would be looking for is where in this vast infra space - ranging from Rs. 10,000 crore sales to Rs. 10 crore sales - will RPP Infra Projects fit in. At FY’10 annual sales of around Rs. 147 crore, RPP Infra clearly falls in the lower-middle segment of the listed infra space and is comparable in revenue to IVRCL Assets. To put RPP Infra’s position in better perspective, its annual sales is lower than noted player GMR Infra, but higher than Mukand Engineers, a Bajaj Group company. The revenue obtained in FY’10 is also not a one-off aberration, following a good growth pattern during the last five years, that is between FY’06 and FY’10, amounting to a CAGR of 28.73%. The order book of RPP Infra is also at good levels, now having Rs. 613 crore worth of projects, that should come in within this fiscal and FY’12. 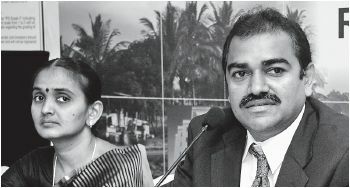 In fact, Chairman & Managing Director Arul Sundaram expects FY’11 top-line to grow by 50%. Anyway, the order book size of 4X times FY’10 revenue signals that the growth curve would continue, at least for the next couple of years. Secondly, investors would be looking at RPP Infra’s profitability levels, and this is crucial in a segment which is prone to volatile profit-loss swings, quarter to quarter and year to year. For FY’10, RPP Infra delivered an EBITDA of around Rs. 17 crore, which amounts to an EBITDA margin of around 11.64%. The margins have been stable compared with FY’09, even slightly improving from last year’s 11.54%. The EBITDA margins are good compared to peers like IVRCL Assets, and slightly better than even Mukand Engineers. However, it is no match to the kind of margins enjoyed by a value-adding operator like GMR Infra. Coming to the valuations front, RPP Infra’s FY’10 EPS was Rs. 5.24 and thus at the top of the price band, the IPO is asking for a price-earnings multiple of 14 odd. However, considering that the IPO also involves a dilution of around 27%, the effective offer P/E on TTM earnings will come to around 19. The infra industry average P/E being 22 odd, the Issue seems to be fairly priced. But the fact that many peers are available much below the average P/E might confuse investors. For example, Mukand Engineers is available at a P/E of less than 8. On the flip-side, many infra stocks are known for unimaginably high P/Es, one of the best examples being GMR Infra’s TTM P/E of 4965. Coming to valuation by book value, on a book value of around Rs. 16, the P/BV comes to 4.6 times, which is again, not-so-high but not-so-low either, with many infra shares trading on higher and lower P/BVs. But IPOs, especially smaller IPOs often tend to outperform as markets ascribe to them a better rating than listed peers. Also taking into consideration that India’s infra sector is set to boom, and taking into account the promoters professional background, diversification into irrigation and BOT, and the company’s growth prospects, RPP Infra Projects can be said to be a reasonable buy. RPP Infra IPO is the first IPO to benefit from the recently increased retail investment limit of Rs. 2 lakh.